The Molokai Fire Department and the National Oceanic and Atmospheric Administration personnel tried to save a beached whale in Kawela yesterday, but the mammal had to be euthanized. A fire official said the beaked whale, about 11 feet long, had beached itself in the morning. When the whale started to swim out, fire personnel on personal water craft assisted NOAA by guiding the whale to shore so it could be treated. The whale was still alive when it was turned over to NOAA personnel, but it appeared sick, a fire official said. It was euthanized in the afternoon, said a NOAA official. The Coast Guard assisted by picking up the roughly 2,500-pound whale in a C-130 plane and transporting it to Honolulu for a necropsy. More than 120 swimmers were stung by box jellyfish yesterday in the monthly influx, which led city officials to close Hanauma Bay. The city Ocean Safety Division posted warning signs along the Waikiki shoreline where 111 people reported being stung and lifeguards counted 586 jellyfish washed ashore. One person was stung at Ala Moana Beach Park. Hanauma Bay was closed at 10:30 a.m. after 15 people said they were stung in one hour. The popular marine life nature preserve is always closed on Tuesdays and is expected to be open tomorrow. Box jellyfish come close to shore to spawn nine or 10 days after a full moon. Beaches that are most commonly affected are Waikiki, Ala Moana, Hanauma Bay and sometimes Makaha. A Circuit Court judge has issued a $100,000 warrant for the arrest of a 21-year-old Oahu Community Correctional Center inmate who fled while on supervised release. Roxanne P. Garcia was on temporary supervised release in the custody of her attorney when she fled from the prison's visitor parking lot, located outside the prison's perimeter fence, yesterday about noon, said Louise Kim McCoy, spokeswoman for the Department of Public Safety. Garcia was returning from an assessment meeting at a drug treatment facility when she fled on foot. Her attorney said he immediately called police to report the incident. Technically, she is not an escapee and is in violation of the terms of her supervised release, Kim McCoy said. Garcia was placed in custody at OCCC March 24, charged with two counts of burglary, and was being held in lieu of $75,000 bail. She left OCCC yesterday at 8:15 a.m. with her attorney, George Burke. She was incarcerated until sentencing Sept. 23, Judiciary spokeswoman Marsha Kitagawa said. Garcia was convicted March 28 of second-degree unauthorized entry into a motor vehicle, a misdemeanor, and convicted in 2005 of petty misdemeanors. Police arrested a 17-year-old boy who was seen allegedly burglarizing a home early Friday. About 1 a.m., a 40-year-old man saw lights inside a Waipahu home, knew the victim was not home and called police. Police found a window screen torn and hanging from a window frame. Another officer was looking through a back window when he saw the boy allegedly carrying a woman's handbag and running toward the front door. The suspect was stopped outside the home and arrested on suspicion of first-degree burglary. The medical examiner was trying to identify the age of a human bone found at a Waikiki construction site near Beach Walk Saturday. Preliminary examination by an archaeologist could not determine if the bone was ancient or recent. It was turned over to the medical examiner for further analysis. Police arrested a 30-year-old man for allegedly hitting and threatening his 29-year-old wife. About 12:55 this morning, the wife reported that her husband hit her and threatened to kill her in their Waianae home. The suspect fled with a handgun in his possession, police said. He was found nearby and arrested on suspicion of a firearm violation, abuse of a family member and second-degree terroristic threatening. Police arrested a man and a woman for allegedly trying to kill another man in Ahuimanu with a knife and a car. At 10:21 last night, Kaneohe patrol officers were dispatched to the intersection of Melekula and Ahuimanu roads to investigate a stabbing. Officers found a 23-year-old man who was slashed on his hand, allegedly by a 44-year-old man with whom he had been arguing, police said. The victim told officers that a 36-year-old woman tried to hit him with her car. The suspects had fled but were found nearby and arrested on suspicion of one count each of attempted second-degree murder. The victim was taken to the Castle Medical Center and was treated and released. Police had no suspects yesterday in the case of a homemade bomb that damaged a 33-year-old woman's vehicle in Honolulu. Police said an "improvised explosive device" was attached to the outside of the woman's vehicle, which was located in a parking lot, and detonated about 2 a.m. yesterday. The driver's side mirror and door frame were damaged when the device was detonated, police said. No other damage or injuries were reported, police said. Police have opened a first-degree criminal property damage case. Honolulu fire and rescue personnel were called to the Lanai Lookout on East Oahu shortly after noon yesterday to help a man who had fallen about 50 feet down the rocky slope while taking photos. A visitor in his 50s was in serious condition yesterday afternoon after falling about 50 feet near the Lanai Lookout in East Honolulu. Fire Capt. Terry Seelig said the man fell shortly before 12:19 p.m. onto a rocky area near the Lanai Lookout, where he had stopped to take some photos with his family. Lifeguards got to the man first, arriving by personal rescue craft, and assisted the man. 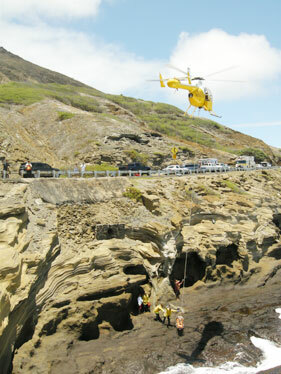 Fire personnel hiked down and placed the man in a basket, and airlifted him by helicopter to the highway at 12:55 p.m. He was transferred into an ambulance and taken to a hospital in serious condition, Bryan Cheplic, a spokesman from the Department of Emergency Services. Police were investigating yesterday a 20-year-old man who allegedly sexually assaulted an 18-year-old woman in Kaneohe. Police said the woman complained of being sexually assaulted by the man at about 4 a.m. Sunday. Further details were not available. A brush fire burned about 2 acres in a dry, rocky stream bed in Lualualei yesterday afternoon. Fire Capt. Terry Seelig said the area, off Lualualei Homestead Road between Mailiili and Puhawai roads, was overgrown with brush and difficult to reach. The fire was reported at 3:07 p.m. and about 25 firefighters had the blaze contained at 4 p.m.
HILO » Kawaihae Harbor on the Big Island was closed for 2 1/2 hours yesterday after an accident involving Vikane, a gas used to kill termites, during the unloading of a Young Bros. barge. No gas leaked and there were no injuries. About 11 a.m., a 24-foot shipping container fell onto another open container called a "flat rack" that held 12 cylinders, each holding 150 pounds of Vikane, said fire Capt. Ted van Gelder. None of the cylinders broke or leaked, he said. Officials closed the harbor as a precaution as they cleaned up after the accident. Firefighters brought harbor personnel self-contained breathing devices -- masks with tanks of compressed air -- and containers were unloaded in an orderly fashion, van Gelder said. The harbor was reopened about 1:30 p.m.
HILO » Big Island police are investigating as a negligent injury an accident involving a farm truck and a pedestrian that left the pedestrian in critical condition, they said. The accident was reported in a farming area on a side road at Pepeekeo, about 10 miles north of Hilo, at 7:17 p.m. Saturday. Police interviewed the driver of the truck, which was carrying produce to a processing area, but did not arrest him. The 20-year-old victim, whose name was not released, was taken to Hilo Medical Center in critical condition with numerous head and body injuries, police said. Anyone with information about the collision is asked to call Officer Malia Bohol at 961-2213, Robert Pauole at 961-2332 or the police non-emergency number at 935-3311. A brush fire burned 25 acres and briefly threatened one house makai of Highway 11 in Honaupo in the Kau District of the Big Island early Sunday. The fire was reported at about 4:45 a.m. near the 61-mile marker of the highway, according to a Hawaii County Fire Department news release. The fire was eventually contained between the highway, the ocean, lava fields and Whittington Park, the release said. The house was spared.